(Newser) – Popular mobile game Candy Crush, which the Verge notes is typically played "while passing time on the toilet or the subway," will soon be played on your television. 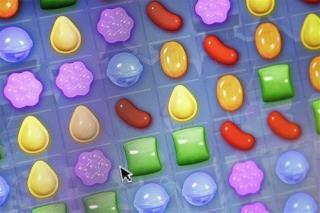 CBS is developing Candy Crush, a one-hour game show based on the game. Candy Crush, which tasks players with matching groups of candy to score points, is pretty boring to watch, so here's hoping the TV version will use the name and little else. E! News, quoting a statement from CBS, says Candy Crush will feature teams of two using their "wits and physical agility to compete on enormous, interactive game boards featuring next generation technology to conquer Candy Crush and be crowned the champions." I've always enjoyed watching pedestrians playing games on their smartphones while bumping into parking meters, lamp posts, signs and so on. Any really engaging game qualifies, as they can't focus on their game and watch where they're walking at the same time. The best place to watch is down in Chicago's Loop, where the cabbies show no mercy for those staring down at their phones while crossing the street against the light. They always want to make a good impression, and some do! SPLAT! Hey, we have a winner! I am thinking of setting up a web cam of the grass growing in my backyard. Anyone interested is watching it? It'll be a cold day in hell before I "play Candy Crush," much less watch it on TV. So much to do, and so little time.